Save an extra 20% off plus get free shipping through July 30 during the Macy’s WKND sale. 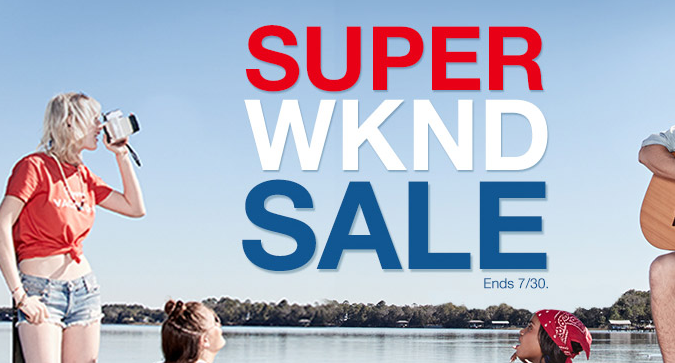 This isn’t just any Macy’s weekend sale; no, it’s the WKND sale because we don’t have time to say weekend AND shop! Seriously though, I do love this because they’re giving you the savings code right in the sale title. All you have to do if you’re shopping at Macys.com is enter code WKND to save (up to) an extra 20% off through July 30. Plus, if your order is $49 or more, you’ll also qualify for free shipping. In case you missed it, I gave you step by step instructions for a Kipling Backpack deal that perfectly illustrates how to take full advantage of this weekend’s sale codes. Another INCREDIBLE backpack deal is this High Sierra backpack that’s over 50% off right now (& also qualifies for free shipping). The High Sierra XBT Checkpoint Friendly Laptop Backpack is normally $160 but during the WKND sale, it’s just $63.99…that’s almost $100 off! And this is just one of the hundreds of deals you’ll find right now. Some states are even offering tax-free shopping for back to school this weekend, but the beautiful thing about that is that you don’t even have to be buying back to school clothes or accessories to get in on the deal (just make sure to check on your local limitations before shopping). So whatever you have planned this weekend, just make sure you don’t miss out on this opportunity to save before the end of the month. Sale prices end July 30.